I think I spent half of my childhood in the kitchen, watching my Mom and grandmother make koldūnai (kohl-doo-nayh), the Lithuanian version of a pierogi, by hand at lightning speed. 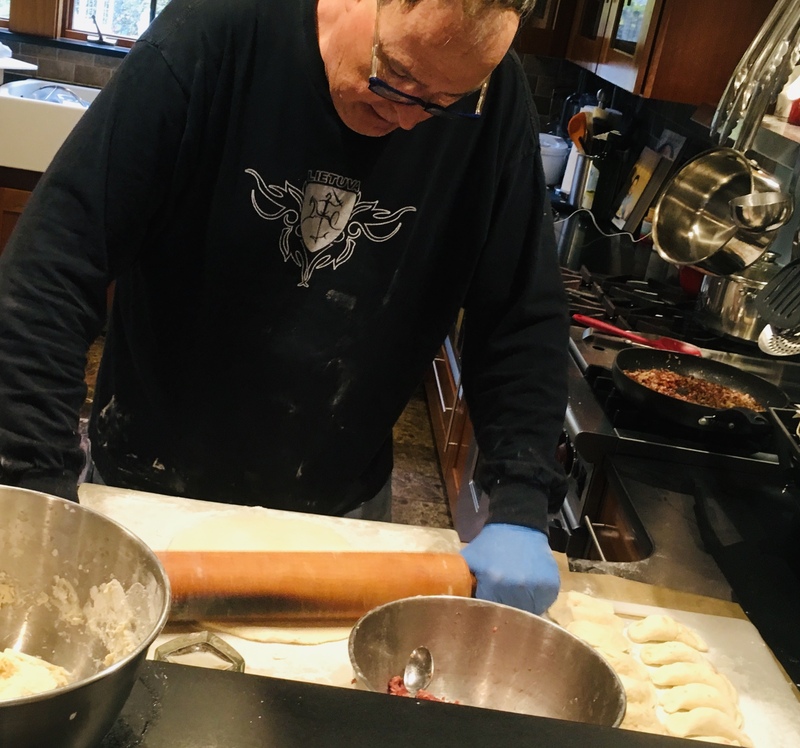 They would roll a simple dough into a log about 1″ in diameter, then cut it into 1″ pieces, twirling each piece between their fingers to make a flat pancake, filling each with a small spoonful of meat or mushrooms, then fold it over, crimping the edges to make a crescent-shaped dumpling. It blew my mind that they could crank out over a hundred of these little masterpieces in no time, placing them on a cookie sheet and freezing them until it was time to cook. Always on the lookout to make my job easier, I discovered a new tool last year: a device that makes faster work of koldūnai production, though they do come out much smaller. It’s a ravioli maker, and the Lithuanian purists I chatted with on social media didn’t like it. I was willing to give it a try if it meant that I could save myself a lot of time. 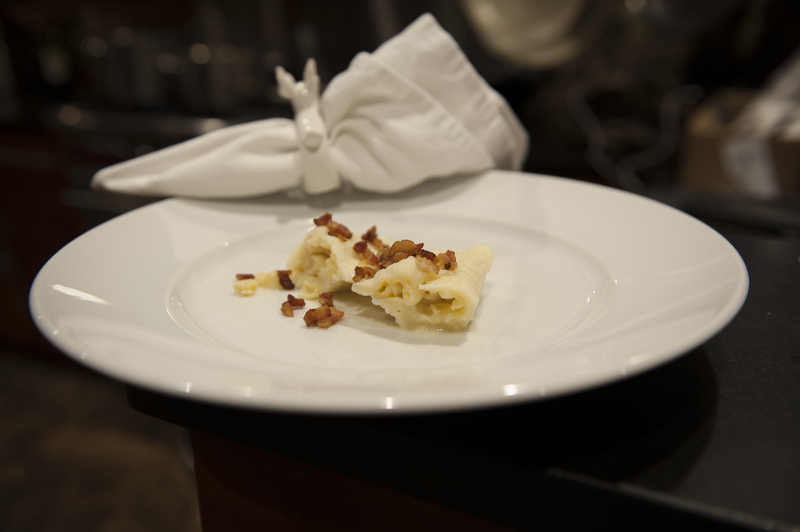 Simply roll out a sheet of dough on top of it. Add a spoon of filling (in this case, ground beef) in each area. Then roll out another sheet of dough on top of that and press down with a rolling pin. Voila! Out pop 37 mini-koldūnai at once! I first tried it with gluten-free dough, with limited success. The dough needs to have elasticity for the device to work properly and that’s something that is sorely lacking in any gluten-free dough I’ve made over the years. Gluten-free dough tends to dry out quickly and simply break rather than bend. But, that said, I managed to make a decent amount of them so that my wife, who maintains a gluten-free diet, could enjoy them, too. Always great to have a helper in the kitchen! One of the main reasons Lithuanian koldūnai beat Polish pierogis is the filling. 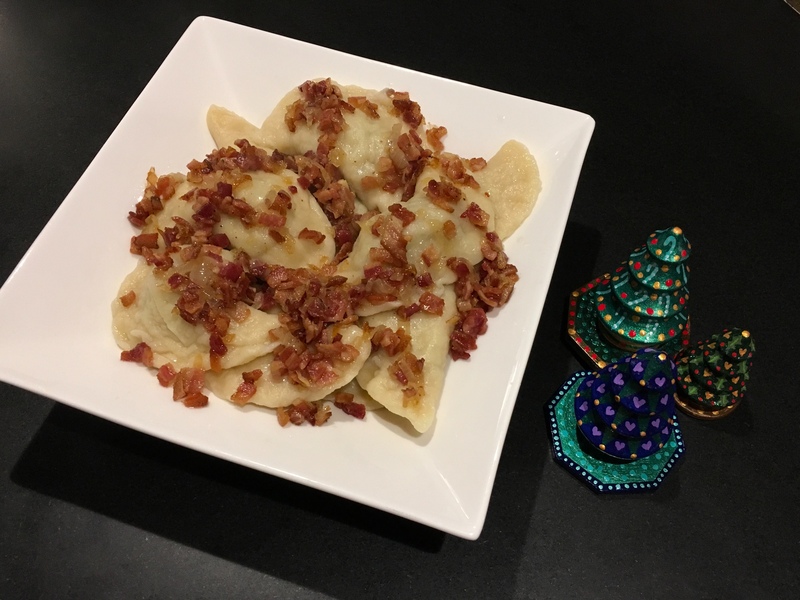 For me, standard pierogi fillings like potatoes, cheese, and sauerkraut just don’t cut it. My Mom would mix ground beef with chopped onions sautéed in butter, a couple of eggs, and milk crackers soaked in milk. She’d add salt and pepper, then spoon that mixture into her koldūnai. The other stuffing, usually reserved for special holidays like Christmas Eve and Easter, was made from mushrooms. Italy may lay claim to the porcini, but the fact of the matter is, Lithuania is porcini heaven. And when they’re dried and reconstituted, their incredible flavor is so intense, you don’t need many of them to flavor a large amount of regular button mushrooms. We’d get our dried boletes from relatives in Lithuania every year. Mom would place a handful in some boiling water and let them steep until they swelled up and could easily be chopped and added to the other mushrooms. She’d then pour the mushroom liquid into the pan as well, not wasting a bit of that magical porcini flavor. The mushrooms were simply sautéed in butter, cooled, then used to fill the koldūnai. I found that my Mom’s log method was too much work. I roll the dough out into a sheet with a rolling pin, then cut circles with a glass. Yes, that’s mac-and-cheese in the forefront. A few years ago, I decided it was time to try my hand at making koldūnai. 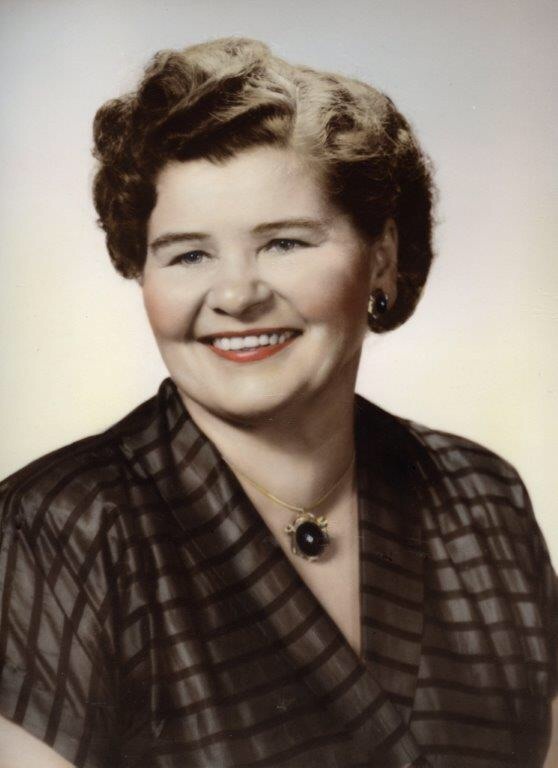 As I recall, my Mom simply mixed water with flour to make the dough, kneaded it into a log, and off she went. I decided to go with the rolling pin and glass cutting method in addition to the ravioli maker, because I wanted to compare the classic crescent-shaped koldūnai with the newer mini’s. The biggest challenges I had with making my own koldūnai was my own clumsiness and lack of experience. Once I got the hang of it, things moved along steadily, and it didn’t take long for me to make a decent batch–not all perfect, but not bad for a first try. This time around, I made four kinds of koldūnai: traditional (ground beef as well as mushroom) and non-traditional (mac & cheese and pulled pork.) Patty’s Pierogis, a restaurant in nearby Fall River, Massachusetts, and featured on Food Network’s “Diners, Drive-Ins and Dives,” is where my daughter first had mac & cheese pierogis. She was instantly hooked and begs for them every year. I make my gluten-free breadcrumbs with Udi’s frozen GF bread that I toast, then chop in a food processor. I think it tastes better than store-bought GF breadcrumbs in a can. Finely chop the onion and saute it in the butter until translucent. Let it cool, then add it to 1 lb. of thawed ground beef. Add the egg and the breadcrumbs. Season with salt and pepper. Mix the ingredients thoroughly and keep the meat in the fridge until you’re ready to use it. 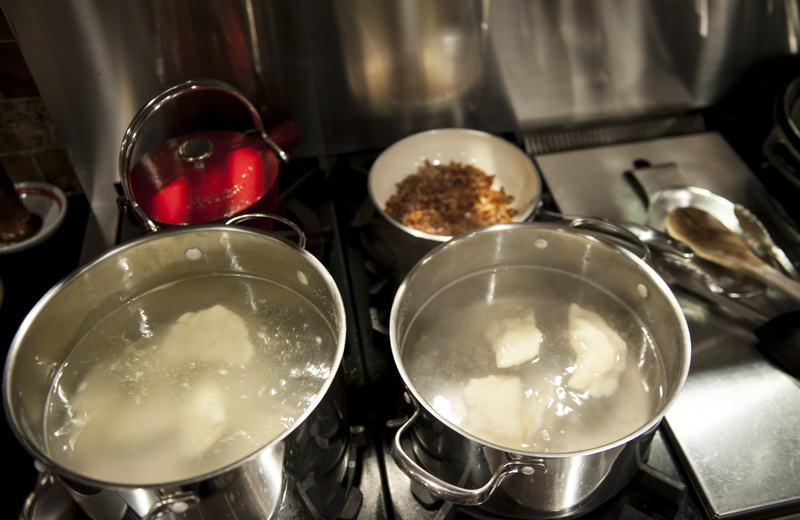 Two pots of boiling salted water: one for the meat-filled koldūnai, and one for the mac-and-cheese filled koldūnai. In my childhood home, you cannot possibly serve koldūnai without sour cream on the side and without spirgučiai (spir-guh-chay), chopped and fried bacon and onions that are sprinkled on top. Making the dough is simple. I don’t use salt in the dough because I boil the koldūnai in salted water later. Combine the ingredients in a bowl, mixing with your hands. Keep adding flour in small amounts until the dough isn’t wet and sticky. When it forms a nice ball, remove it from the bowl and place it on a floured surface and knead it a bit more. 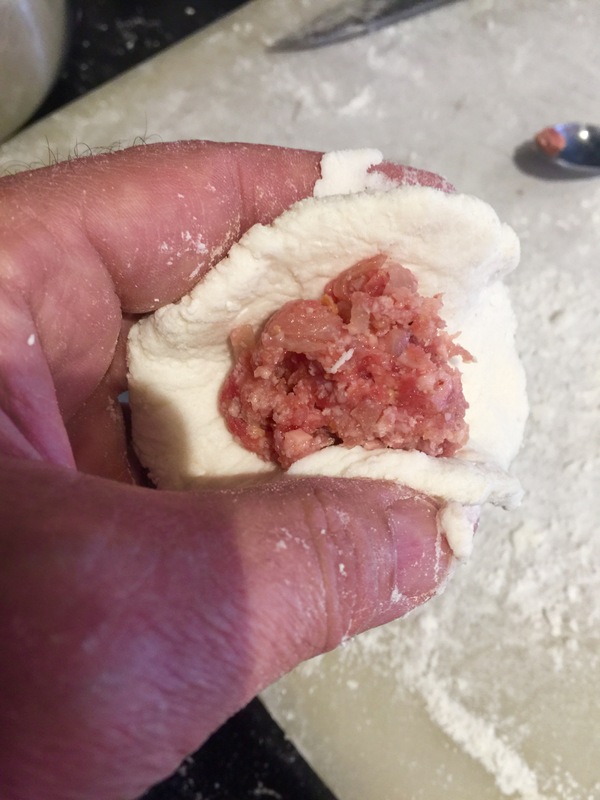 Cut the ball into quarters, and work with these smaller pieces of dough. 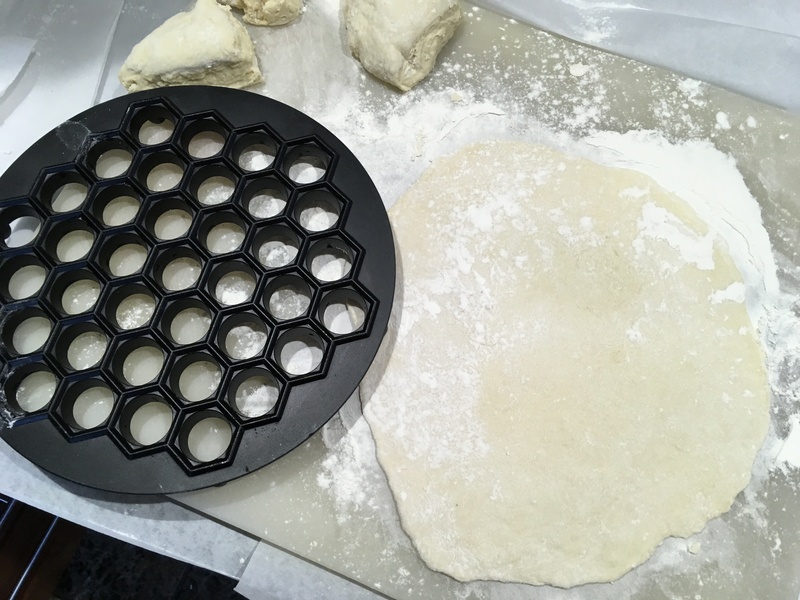 If you’re using the ravioli maker method, each quarter will make one sheet of dough for the top or bottom of the ravioli maker. If making them by hand, each sheet will give you about 8 crescent-shaped koldūnai. 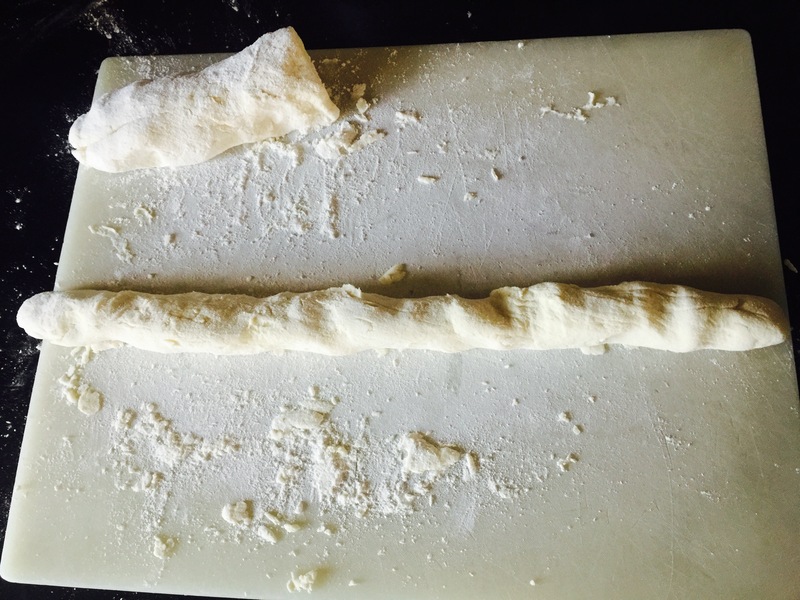 For the rolling-pin method, roll each quarter out until the dough is about 1/8″ thick. 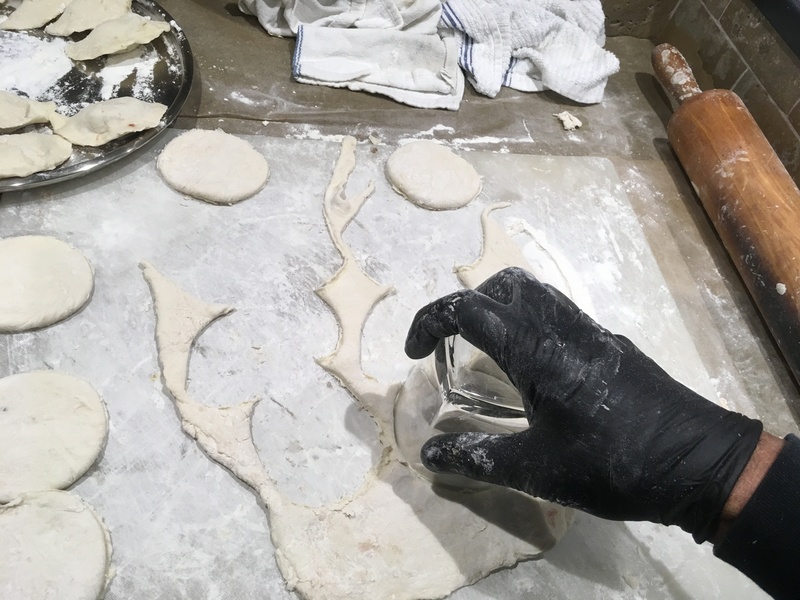 Using a rocks glass as your cutter, cut circles out of the dough. 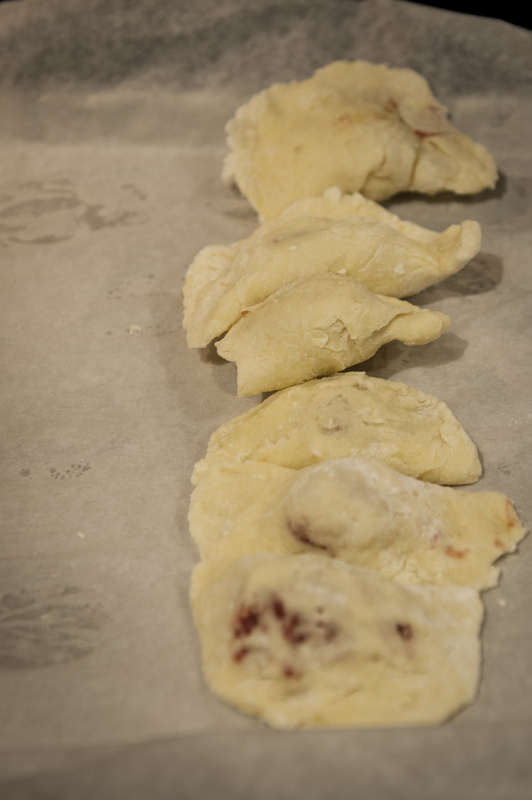 Add a small spoonful of filling in the center of the dough, then fold the edges over and pinch them with your fingers. Flip it over and pinch again, making sure none of the filling seeps out. A tight edge means the koldūnai won’t break open when you put them in boiling water. Who knew a rocks glass had more uses than just to hold a great Manhattan? Some stuffed with mac and cheese! Place the koldūnai on a sheet pan lined with parchment paper, and when you’re done, place the sheet pan in the freezer. Sometimes the chef gets punchy after making koldūnai all day long! When plating, sprinkle generously with spirgučiai, and serve with sour cream on the side. My conclusion: When all is said and done, the old ways are still the best. Although the ravioli maker did a good job, in many ways it was just as time-consuming. And the finished mini-raviolis did not have the dough-to-filling ratio that I find so satisfying with classically made koldūnai. We sampled both side-by-side, and there really was a difference. I’m sticking with the classic methods for now! Mom will be proud. The hand-painted Christmas trees in the photos are from our friend, Don Cadoret, an artist here in Tiverton, RI. Check out all of his work at: http://www.doncadoret.net. Always on the lookout to make my job easier, I discovered a new tool this year: a device that makes faster work of koldūnai production, though they do come out much smaller. It’s a ravioli maker, and the Lithuanian purists I chatted with on social media didn’t like it. I was willing to give it a try if it meant that I could save myself a lot of time. The other stuffing, usually reserved for special holidays like Christmas Eve and Easter, was made from mushrooms. Italy may lay claim to the porcini, but the fact of the matter is, Lithuania is porcini heaven. And when they’re dried and reconstituted, their incredible flavor is so intense, you don’t need many of them to flavor a large amount of regular button mushrooms. We’d get our dried boletes from relatives in Lithuania every year…the real deal. Mom would place a handful in some boiling water and let them steep until they swelled up and could easily be chopped and added to the other mushrooms. She’d then pour the mushroom liquid into the pan as well, not wasting a bit of that magical porcini flavor. The mushrooms were simply sautéed in butter, cooled, then used to fill the koldūnai. I found that my Mom’s log method was too much work. I rolled the dough out with a rolling pin, then cut with a glass. Yes, that’s mac-and-cheese in the forefront. 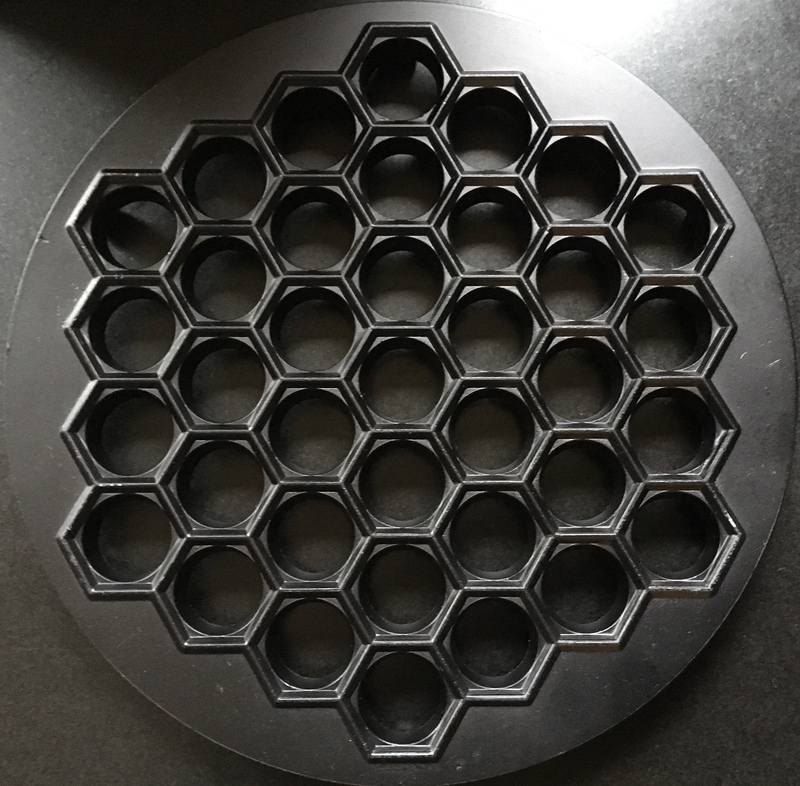 A few years ago, I decided it was time to try my hand at making koldūnai. As I recall, my Mom simply mixed water with flour and a little salt to make the dough, kneaded it into a log, and off she went. I decided to go with the rolling pin and glass cutting method, in addition to the ravioli maker, because I wanted to compare the classic crescent-shaped koldūnai with the newer mini’s. The biggest challenges I had with making my own koldūnai was my clumsiness and lack of experience. Once I got the hang of it, things moved along steadily, and it didn’t take long for me to make a decent batch–not all perfect, but not bad for a first try. Finely chop the onion and saute it in the butter until translucent. Let it cool, then add it to 1 lb. of thawed ground beef. Add the egg, the breadcrumbs, and the milk. Season with salt and pepper. Mix the ingredients thoroughly and keep the meat in the fridge until you’re ready to use it. Making the dough is simple. I add an egg to my Mom’s original recipe. I think half my childhood was spent in the kitchen, watching my Mom and grandmother make koldūnai (kohl-DOO-nayh), the Lithuanian version of a pierogi, by hand at lightning speed. 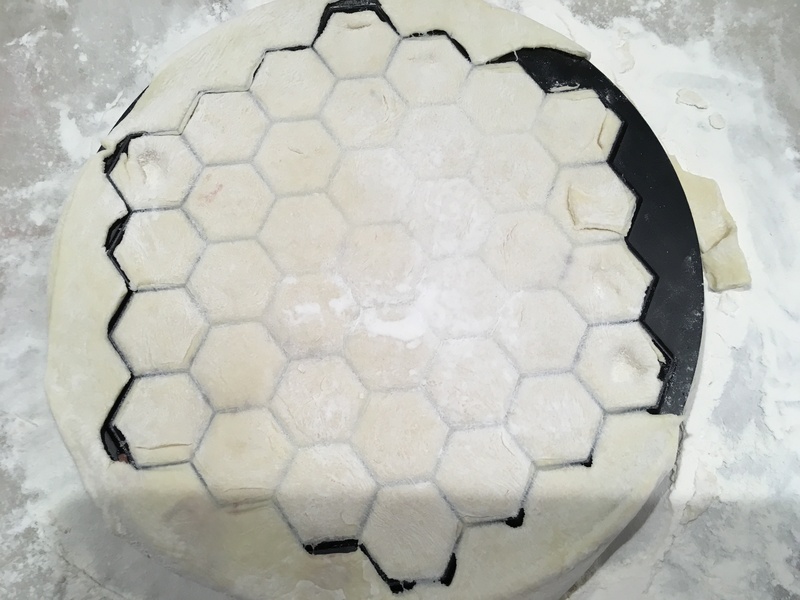 Some Lithuanian cooks make the dough, roll it out into a large flat sheet with a rolling-pin, then cut circles out with a glass or a cookie cutter. 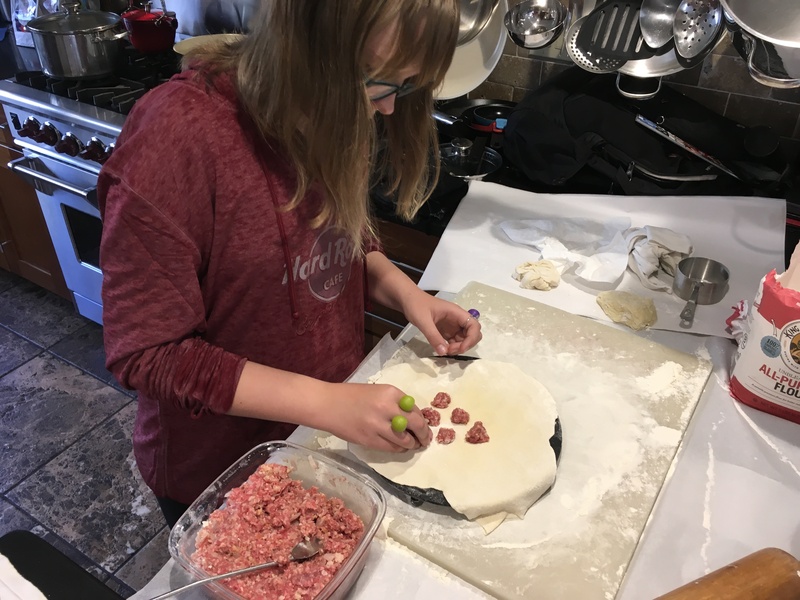 But my Mom and grandmother used a different method: they’d roll the dough into a log, cut it into 1″ pieces, and then twirl each piece in their hands to make a flat pancake that they would then fill with a spoonful of meat or mushrooms. It blew my mind that they could crank out over a hundred of these perfectly shaped dumplings in no time, placing them on a sheet pan and freezing them until it was time to cook. One of the main reasons koldūnai beat pierogis every time is the filling. My Mom would mix ground beef with chopped onions sautéed in butter, a couple of eggs, and milk crackers soaked in milk. She’d add salt and pepper, then take a spoonful of the raw meat mixture and plop it in my mouth. “Enough salt?” she’d ask. I loved the taste of the raw beef like that…probably why I always order beef tartare when I see it on a restaurant menu. The mushroom filling was usually reserved for special holidays like Christmas and Easter. Italy may lay claim to the porcini, but the fact of the matter is, Lithuania is porcini heaven. They’re called baravykai (buh-ruh-VEE-kayh), and when they’re dried and reconstituted, their incredible flavor is so intense, you don’t need many of them to flavor a large amount of cheaper button mushrooms. We’d get our dried boletes from relatives in Lithuania every year…the real deal. (They’d even have a radiation-free certification sticker on the bag, thanks to Chernobyl!) Mom would place a handful of the dried mushrooms in some boiling water and they would rehydrate, nice and plump, and could then easily be chopped and added to the other mushrooms. She’d pour the mushroom liquid into the pan as well, not wasting a bit of that magical porcini flavor. The mushrooms were simply sautéed in butter, cooled, then used to fill the koldūnai. 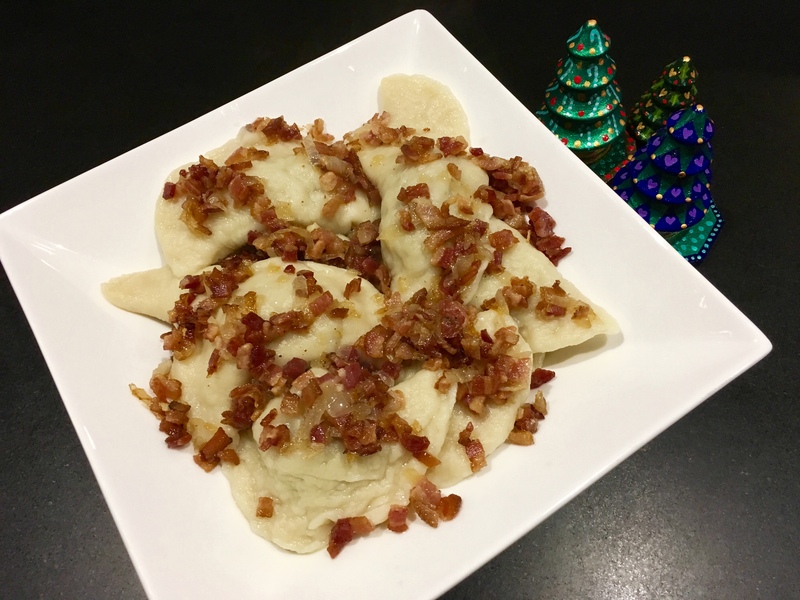 Basic Polish pierogi fillings include sauerkraut or potatoes with cheese. There’s no question the Lithuanians got this round. It was time to try my hand at making koldūnai. As I recall, my Mom simply mixed water with flour to make the dough, kneaded it into a log, and off she went. My challenge was a bit more daunting: I needed to make them gluten-free as well. My sister, whose family lives the GF lifestyle, told me that they simply exchange all-purpose flour for gluten-free flour and it works fine. I had my doubts and first tried a recipe I found online that used a slurry of cottage cheese, eggs, and milk with the flour, but I found that it was overkill. The dough was very sticky and hard to work with. So I tried the simple recipe of water and flour (a half-cup of water for every cup of gluten-free flour) and it worked well. I dusted a board with more flour, and moved the flour from the bowl onto the board. I kneaded it into a long log, about a foot long and 1 1/2″ thick. I cut it into 12 equal pieces, about 1″ wide. 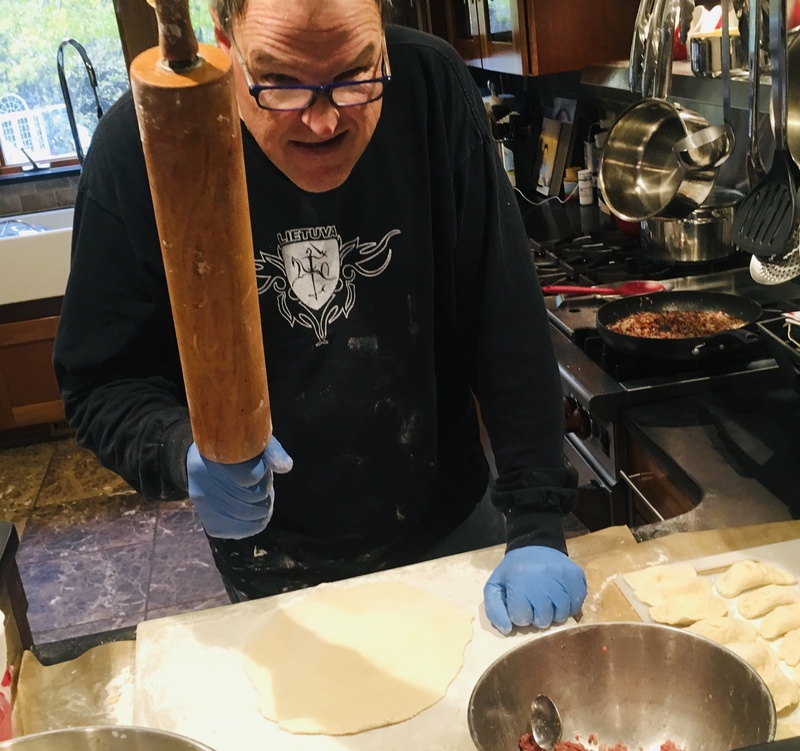 Taking one cut piece, and using my thumbs, I twirled the dough around, flattening it into a small pancake, the way I remember my Mom and grandmother used to do it. I placed a teaspoon of filling in the center of the pancake, then folded one side over so that it met the edges of the other side. I pressed with my fingers to make the two halves stick together and formed a seal. The beef filling. I decided to wear gloves soon after this photo. The biggest challenges I had with making koldūnai was my own clumsiness and lack of experience. But once I got the hang of it, things moved along steadily, and it didn’t take long for me to make a couple of dozen. I placed them on a sheet pan lined with non-stick aluminum foil (you can also use parchment paper) and placed them in the freezer to harden. Once hard, they go in freezer bags until ready to boil. The mushroom filling was nothing more than chopped button mushrooms combined with chopped porcinis that had been rehydrated, all sautéed in butter. The mac-and-cheese filling was a gluten-free mac-and-cheese dinner out of a box. To make the breadcrumbs, I took a couple of slices of whole grain gluten-free bread and toasted them. Then I ground them up in a blender or food processor. The taste is far better than store-bought GF breadcrumbs, which usually are rock-hard rice nuggets. I finely chopped the onion and sautéed it in a little butter until translucent. I let it cool, then added it to 1 lb. of thawed ground beef. I added the egg, the breadcrumbs, and the milk. I seasoned it with salt and pepper, and I mixed everything thoroughly, keeping the meat mixture in the fridge until I needed it. You can serve them straight out of the boiling water, but dropping them in a pan with a little butter to lightly sauté them a bit before serving is really the way to go. When plating, sprinkle generously with spirgučiai, and serve with sour cream. Enjoying each variety of koldūnai on a cold winter’s night with friends. 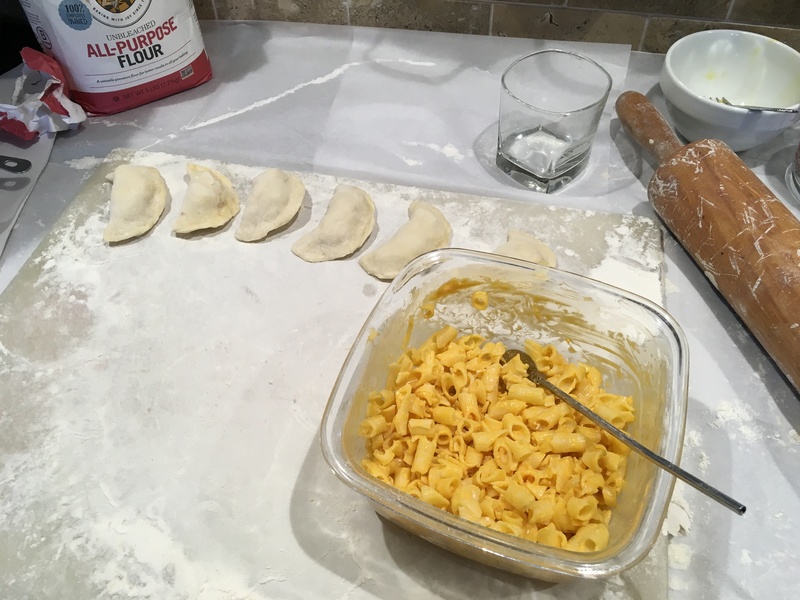 I think half my childhood was spent in the kitchen, watching my Mom and grandmother make koldūnai (kohl-doo-nayh), the Lithuanian version of a pierogi, by hand at lightning speed. Some Lithuanian cooks would make the dough, roll it out into a large flat sheet with a rolling-pin, then cut circles out with a glass or a cookie cutter. 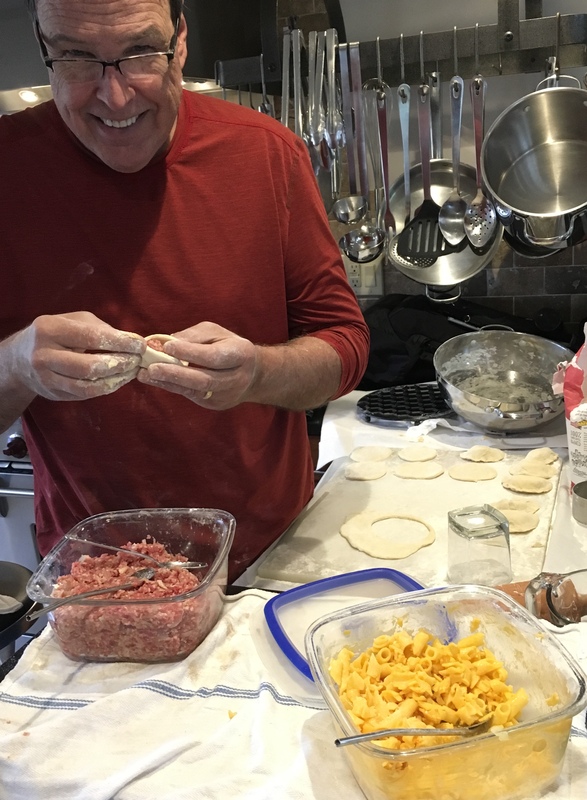 But my Mom and grandmother used a different method: they’d roll the dough into a log, cut it into 1″ pieces, and then twirl each piece in their hands to make a flat pancake that they would then fill with a spoonful of meat or mushrooms. It blew my mind that they could crank out over a hundred of these perfectly shaped dumplings in no time, placing them on a cookie sheet and freezing them until it was time to cook them. One of the main reasons koldūnai beat pierogis every time is the filling. My Mom would mix ground beef with chopped onions sautéed in butter, a couple of eggs, and milk crackers soaked in milk. She’d add salt and pepper, then take a spoonful of the raw meat mixture and plop it in my mouth. “Enough salt?” she’d ask. 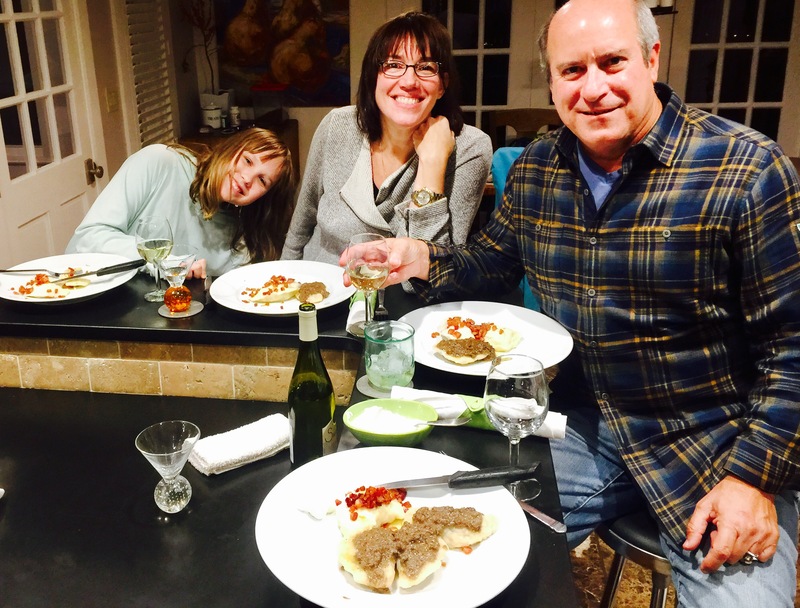 My sisters and I loved the taste of the raw beef like that…probably why I always order beef tartare when I see it on a restaurant menu. The other stuffing, usually reserved for special holidays like Christmas and Easter, was made from mushrooms. Italy may lay claim to the porcini, but the fact of the matter is, Lithuania is porcini heaven. And when they’re dried and reconstituted, their incredible flavor is so intense, you don’t need many of them to flavor a large amount of cheaper button mushrooms. We’d get our dried boletes from relatives in Lithuania every year…the real deal. Mom would place a handful in some boiling water and let them steep until they swelled up and could easily be chopped and added to the other mushrooms. She’d then pour the mushroom liquid into the pan as well, not wasting a bit of that magical porcini flavor. The mushrooms were simply sautéed in butter, cooled, then used to fill the koldūnai. 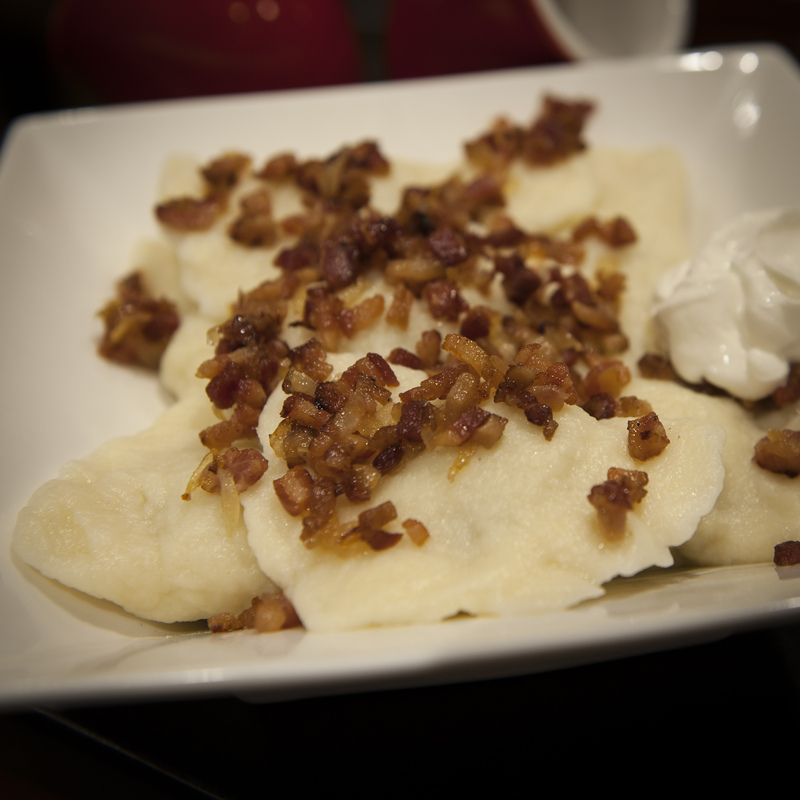 Common pierogi fillings are potatoes or sauerkraut. I think the Lithuanians got this round. Not perfect, but not bad for a first attempt. And the GF dough was tough to deal with at first. 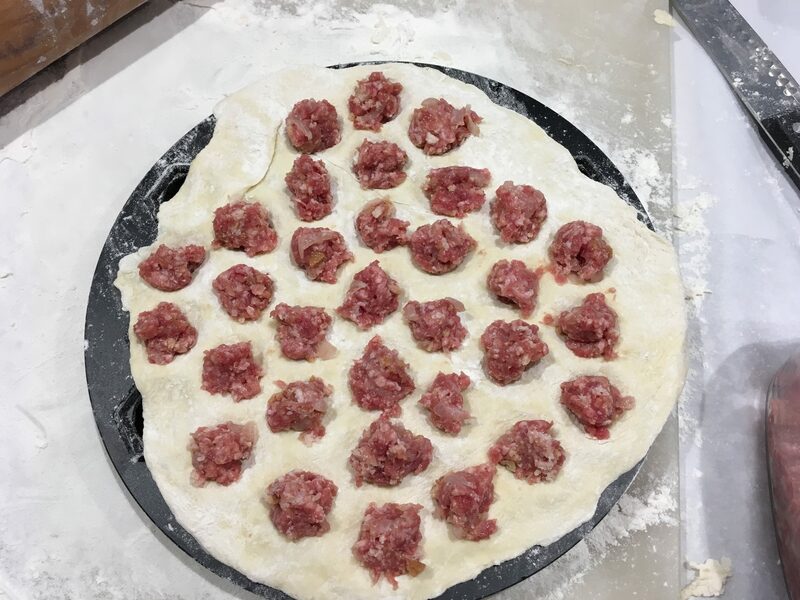 I made sure the exposed meat was covered by dough before placing in the freezer. Otherwise, they would open up in the boiling water and make a mess. So this past Christmas Eve, I decided it was time to try my hand at making koldūnai. As I recall, my Mom simply mixed water with flour and a little salt to make the dough, kneaded it into a log, and off she went. 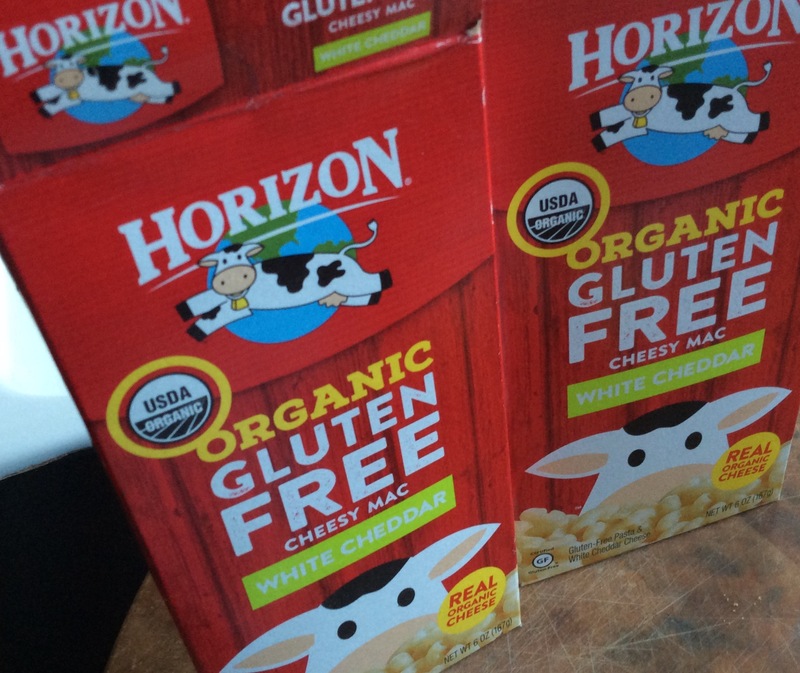 My challenge was a bit more daunting: I needed to make them gluten-free as well. My sister, whose family lives the GF lifestyle, told me that they simply exchange all-purpose flour for gluten-free flour and it works fine. 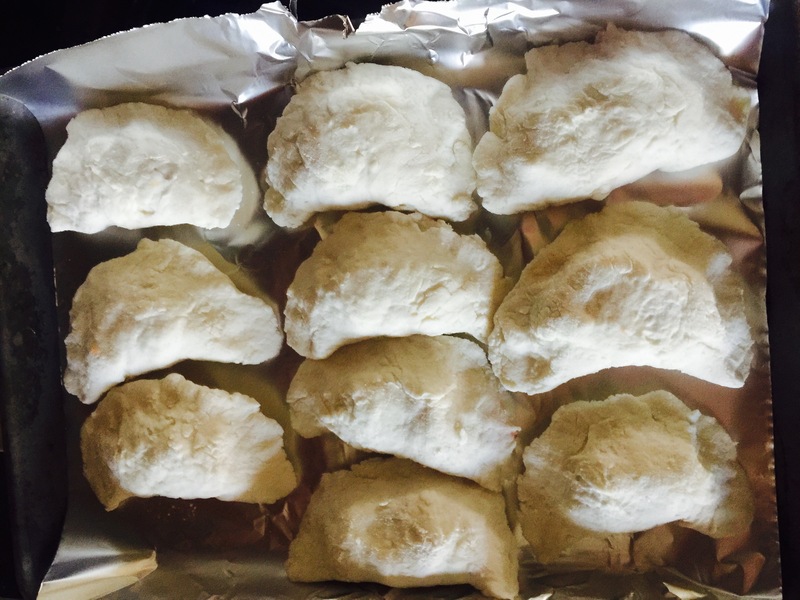 But my experience in trying to bake bread or make pizza dough with gluten-free flour told me that the dough would be tough to work with and would lack the elasticity found in dough made with gluten, so I wanted another option. I found an old recipe on-line that still used the individual GF ingredients (rice flour, potato starch, tapioca flour, etc.) before the advent of Cup 4 Cup, the all-purpose gluten-free flour I now use religiously. I decided I’d substitute my go-to flour for those ingredients and add it to the rest of the recipe. What I got was a soft dough that was relatively easy to work with, just a little sticky. The biggest challenges I had with making my koldūnai was my own clumsiness and lack of experience. Once I got the hang of it, things moved along steadily, and it didn’t take long for me to make 24 gluten-free koldūnai–not all perfect, but not bad for a first try. Since my wife is allergic to mushrooms, I had to skip them this time around and used a ground beef filling instead. And, by my daughter’s special request, I also made 4 mac-and-cheese koldūnai, also gluten-free using GF mac-and-cheese. Finely chop the onion and saute it in a little butter until translucent. Let it cool, then add it to 1 lb. of thawed ground beef. Add the egg, the breadcrumbs, and the milk. Season with salt and pepper. Mix ingredients thoroughly and keep the meat in the fridge until ready to use. Place the flour in a bowl. In a blender, combine the cottage cheese, egg, milk olive oil and salt. Blend until smooth. Pour the liquid ingredients into the bowl with the flour and knead by hand, forming a dough. Dust a board with more flour, and move the flour from the bowl onto the board. Knead it into a long log, about a foot long and 1 1/2″ thick. Cut it into 12 equal pieces, about 1″ wide. As a kid, I always knew my grandmother loved me. After all, she told me that every time I visited her on Saturday afternoons. She lived in Queens, NY, and we’d visit after sitting through 5 long hours of Lithuanian school in Brooklyn every Saturday morning. By the time we got to my grandmother’s house, it was mid-afternoon, and I was starving. She’d greet me with a smile and a kiss on the forehead, and she’d proudly put a plate full of koldūnai (Lithuanian pierogis, usually stuffed with meat instead of potatoes or sauerkraut, and way better) in front of me, steam rising off the freshly-boiled koldūnai, with spirgučiai (fried bacon and onion bits) generously sprinkled on top, and a dollop of sour cream on the side. There were times when I could eat 20 of them. However many I had, it seemed that she still had more, and I never thought for a moment about where they came from. I guess I knew that she made them, but I never really thought about what that meant. Now I cook for my 8-year-old daughter, and the other day, she asked for one of her favorite dishes: ham and cheese croquettes. It’s a long and messy process to make them: boiling and mashing potatoes, chopping up slabs of ham, grating piles of cheddar cheese, mincing onions. Then rolling the croquette filling in flour, egg and breadcrumbs before frying them. It’s not hard work, but it’s tedious. After making 30 croquettes, my back was aching from standing hunched over the kitchen counter. And I was only half done. 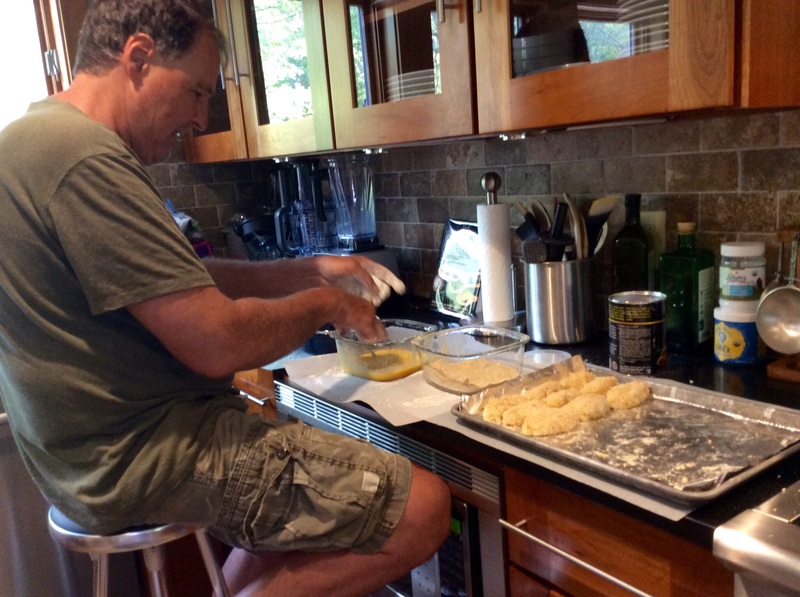 I tried pulling up a stool, but that didn’t help, so I popped a few ibuprofen and kept going, finally frying that last croquette, turning the heat off the oil, and standing back to see a kitchen counter covered in egg, flour, breadcrumbs, and mashed potatoes. The cooking was done but the cleanup was just beginning. My daughter stepped off the school bus at the end of the driveway, and I greeted her with a kiss on the forehead, telling her I loved her. We walked back to the house, and I asked her about her day, all the time knowing that I had a special treat waiting for her that I couldn’t wait to show her. We walked into the house and she saw the trays of croquettes. I placed a couple of them on a plate and she sat down, eyes wide open, and took her first crunchy bite. The heartfelt “Mmmmm” that came from deep inside her gave me a real sense of satisfaction. My hours of work had paid off with one simple bite. Few things could’ve made me happier at that moment than the smile on her face. And then I thought of my grandmother. What I did that day, she did for me every Saturday without fail. And she was a lot older than I am now. She loved me, alright. Funny how it took almost 40 more years for me to realize just how much.